Ed Miliband announced in a speech to the Labour North West regional conference late last year that he plans not just to reform the House of Lords, but to abolish it altogether, replacing it with a fully elected “Senate”. 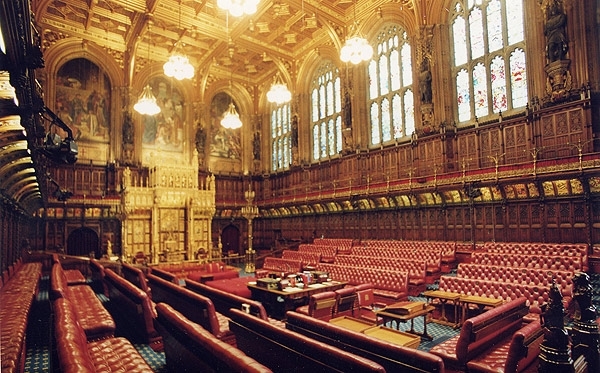 Critics claim the House of Lords represents a unique resource of expertise which has been instrumental in making our laws better for hundreds of years. Moreover, they argue, the Lords acts as an independent bulwark against an overweening Commons vaingloriously stuffing through legislation that is against the common interest. A slightly more technical argument is that, if elected, it may be that the wrong people will get to sit in the new upper chamber. By this they mean that the level of expertise will be lost because people tend to vote for or against the government of the day according to their perceived performance, so it is likely that they will vote politically rather than vote for the person. The consequence of this is the upper chamber will end up looking like the Commons: too male, too pale and too stale. Equally technical is the contention that democracy is in crisis, because too few people are voting and this means that the social groups that tend not to vote: the young, ethnic minorities and the poor will lose out to the white, middle-class, older voters who turn out in their droves. So, making the upper house wholly elected would be counter-productive because it would not be representative of the whole of society. It would be far better to instruct the Appointments Committee to create more Lords who are drawn from those segments of society. Then there is the question of legitimacy. Right now, the House of Lords gains its legitimacy from being acknowledged experts who have gained some distinction in their field. If the upper chamber were elected, then it would gain its legitimacy from the democratic process: it would be the choice of the people. 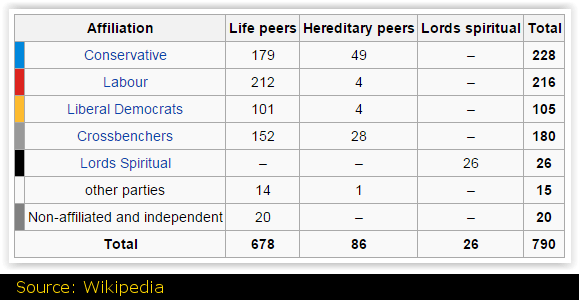 If it were elected by proportional representation, then it may even have superior legitimacy to the Commons. This may well lead to a battle for dominance between the two houses and result in the efficiency of the legislature being damaged. Even worse, a fair proportion of them are wealthy and the biggest group supports the current government (228 Conservatives and 105 Liberal Democrats). This doesn’t give them a majority, but it is more than enough to outvote Labour with just 216 peers. The remaining peers are 180 crossbenchers, 26 Lords Spiritual, 15 from the other parties and 20 non-affiliated / independent. Moreover, the House of Lords is pretty consistent in its defence of the status quo, which given its make-up, is not really surprising. Even given its supposed expertise, it fails to understand the Britain of today, largely because the areas in which that expertise was gained has largely been superseded and anyway in many cases it was a skill-set gained quarter of a century ago. Things are changing fast these days and expertise is no more than a click of a mouse button away. Good judgement and a willingness to do the right thing is far more important expertise in a field that no longer has any bearing on modern society. Ed Miliband’s proposal to abolish the Lords and replace it with a new chamber based on representation of the regions is an idea that has found its time. This is more especially the case with the debate about the powers of the Scottish, Welsh and Northern Irish governments in relation to England being so current. There is very little meat on the bone as yet, but we can expect to hear more over the coming months in relation to the way the new chamber is elected, its specific role in relation to the Commons, but most of it will be decided by a proposed constitutional convention which will involve the Celtic governments and the regions of England, which will occur after the election. Although Sadiq Khan has said, “Labour will come forward with detailed proposals on our plans for the House of Lords in our manifesto closer to the next election,” which suggests that Labour is going to reveal more details pretty soon. Whatever happens between now and May, this policy alone is a very good reason to hope we get a Labour government, because until we have a fully elected legislature, we cannot really call ourselves a democracy. There is no excuse for allowing the Palace (two Lords), and the Church of England (26 Lords) a continued say in how the country is run, irrespective of how well-meaning or otherwise they might be. Having over five hundred of the seven hundred or so peers residing in the South of England is bound to bias the views and experiences of those who are supposed to represent all of us. That’s not to mention those peers who have registered their main residence as overseas – nearly as many as those representing the North East and Northern Ireland. Then you have anomalies like Oxfordshire having roughly the same number of peers as Wales and Hampshire having a similar number to the entire East Midlands.Making the second chamber specifically regional will counter this in the most effective way possible. Putting the composition of the second chamber to the vote will, at a stroke, rid us of claims of cronyism and corruptions like the cash for peerages scandals, which still dog Parliament with recent appointments looking like a who’s who of Conservative Party donors. As things stand, the Lords has too many men, too few ethnic minorities, too many from London and the South East and has little or no democratic legitimacy. The case for reform is overwhelming and moving it from what Tony Benn described as “the British Outer Mongolia for retired politicians” to a modern, democratic chamber is possibly the most exciting constitutional proposal in our lifetimes. Ed Miliband has set out his stall as someone who has reforming zeal and the confidence to trust the British people to make the decisions. He will put this question to the people by creating a constitutional convention of the regions, which will address all the imbalances of the current set-up and create a new chamber that will drag British democracy into the twenty-first century. This is a huge opportunity and it can only be realised by removing the Tories from the equation and electing a Labour government. Currently you don’t have that choice, Sean. Instead you get a load of old politicians and palm greasers. Let’s have a choice, then maybe you’ll get your professors, scientists and clergy. So, what you’re saying is that your opinion is worth more than the rest of us and therefore, we should be denied the right to determine who makes our laws. That’s fair enough, you’re not a democrat, I can live with that, but we live in a democratic age and my view is: if you’re going to have a democracy, you go the whole hog and allow everyone to have a say in who makes our laws. That implies that all legislative bodies must be elected. To say that my opinion is undemocratic then saying your opinion is more important than mine is a bit of a contradiction. My problem is that people are loosing trust in the politicians we have so why are so many people asking for more? I didn’t say my opinion is more important, I said that is what you’re saying. People aren’t losing trust in the politicians we have. Some people are losing trust in some politicians. There you go, speaking for everyone again.